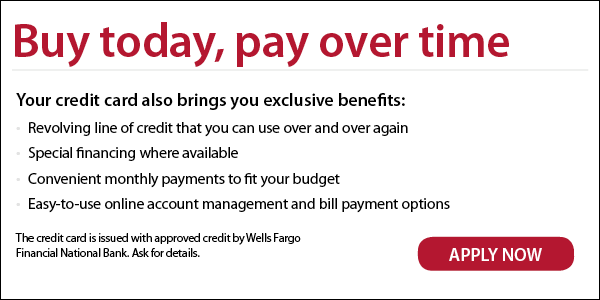 *The Wells Fargo Home Projects credit card is issued by Wells Fargo Financial National Bank, an Equal Housing Lender. Special terms apply to qualifying purchases of $240 or more charged with approved credit. Minimum monthly payments are required during the promotional (special terms) period. Interest will be charged to your account from the purchase date at the APR for Purchases if the purchase balance is not paid in full within the promotional (special terms) period. Paying only the minimum monthly payment will not pay off the purchase balance before the end of the promotional period. For new accounts, the APR for Purchases is 28.99%. If you are charged interest in any billing cycle, the minimum interest charge will be $1.00. This information is accurate as of 09/01/2017 and is subject to change. For current information, call us at 1-800-431-5921. **The Wells Fargo Home Projects credit card is issued by Wells Fargo Financial National Bank, an Equal Housing Lender. Special terms apply to qualifying purchases of $480 or more charged with approved credit. Minimum monthly payments are required during the promotional (special terms) period. Interest will be charged to your account from the purchase date at the APR for Purchases if the purchase balance is not paid in full within the promotional (special terms) period. Paying only the minimum monthly payment will not pay off the purchase balance before the end of the promotional period. For new accounts, the APR for Purchases is 28.99%. If you are charged interest in any billing cycle, the minimum interest charge will be $1.00. This information is accurate as of 09/01/2017 and is subject to change. For current information, call us at 1-800-431-5921.